UPDATE: After being viewed by over 200,000 visitors, Uluru's Field of Light installation has now been extended until December 31 2020. I AM standing in one of the remotest places on earth surrounded by a field of iridescent light. Glistening globes on slender shimmering stems blossom like flowers in the night. Stretching out all around me is a carpet of ever-changing colour like a dot painting of lights beneath the shadowy outline of Uluru. We’ve come to the hot heart of Australia for the launch of Field of Light an incredible art installation from British artist Bruce Munro. There are 50,000 frosted-glass spheres, connected via illuminated optical fibre, planted in the vastness of the desert. It is an extraordinary enterprise; involving transporting thousands of globes from a workshop in the UK to the remote Red Centre (Qantas transported them all without breaking a bulb) , six weeks and a workforce of forty-plus to plant them and the vision of Voyages resorts to make it all happen. As darkness falls the spheres sparkle and overhead in the inky black sky a myriad of stars shine back. It is a surreal sight as invited guests in sequined tops but sturdy boots explore the dusty desert paths between the lights; as they walk they stop talking and start to smile. 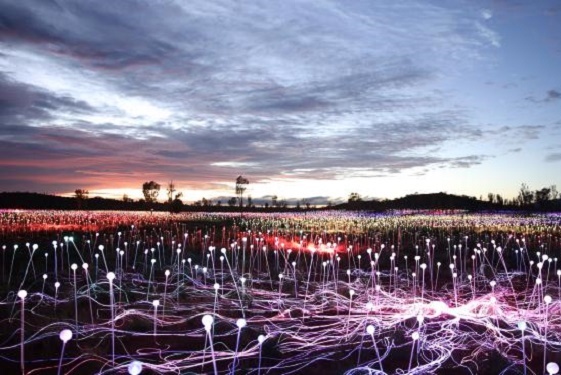 "The Field of Light is a personal symbol for the good things in life." says Munro. “I chose the pallet – red, purple, gold, white and green - to reflect the natural colours of the desert”. It is strange that something as modern as solar-powered lights should somehow capture the essence of this ancient landscape but it does. Officially opening tomorrow (April 1) the radiant bulbs will bloom in the desert for a year – a mere blink of Uluru’s eternal eye –and yet there is a true spirit of place here. It is strange that something as modern as solar-powered lights should somehow capture the essence of this ancient landscape. The local Anangu people think so too. They have embraced the installation and honoured the art with a name in the local Pitjantjatjara language, Tili Wiru Tjuta Nyakutjaku (‘looking at lots of beautiful lights’). The bond between the art and Australia’s Red Centre might not be as surprising as it seems. 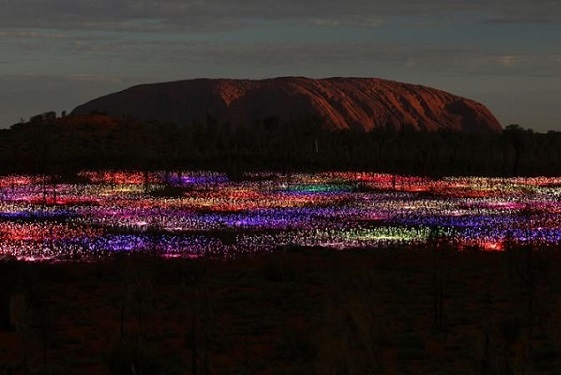 The artist, Bruce Munro, has exhibited different editions of his Field of Light all over the world, yet it all began at Uluru. Almost a quarter of a century ago a young Munro was camping in the outback when he felt a deepening emotional and artistic connection to the vastness of the desert, and to its colours and opalescent light. ‘The red desert had an incredible feeling of energy. Ideas radiated from it along with the heat”, Munro says. Under the spell of Uluru he first imagined an artwork that would come to life at night. ‘I wanted to create an illuminated field of stems that, like the dormant seed in a dry desert, would burst into bloom at dusk with gentle rhythms of light” he explains. Now the installation has finally germinated back in its spiritual home. It is the largest Field of Light that Munro has ever created, in the wildest landscape. In its own way it is as compelling as the great rock itself. We are all drawn to it, we gravitate towards it. The installation becomes another centre point for our time in the Red Centre and we want to see it in all its moods. So I get up early, so early, to visit the field again. As dawn breaks Uluru blushes morning pink. In the foreground the Field of Light fades out. Now the globes look like dew-drops on the desert grass, lustrous and pearly white. I walk back down to them, drawn by their 6.00am shimmer. The slim stalks are silvery and almost more delicate in the daylight. I crouch down and as the sun rises behind the orbs its lemony light turns them all to glistening gold. I like this serene morning experience almost as much as the night time colour show. Munro believes in immersive experiences and interconnectedness. His inspiring installation seems to reach people on many levels; it is joyous and meditative and spiritual all at the same time. It feels good to be around. One thing is for certain the mercurial Field of Light is hard to sum up in words, it needs to be experienced - so if ever there was a time to head to Australia’ s red heart it’s now. The story behind the lights. Read why the landscape inspired artist Bruce Munro HERE. • The 4.5-hour A Night at Field of Light ($235) includes an introduction to the artwork by a host, sparkling wine and canapes at sunset from an elevated viewing area, extended time to immerse in the installation and a three-course buffet dinner showcasing bush tucker ingredients as well as return bus transfers.